You may receive coupons every time you meet Coach Lior Doron. 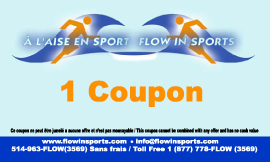 In addition, coupons are given when you successfully complete 90% or more of your homefun or follow instructions from the Flow in Sports coaches. You may also exchange coupons for prizes from our sister website called the Tennis & Sports Psychology Academy. Click here to see the prize list. Here is our prize redemption table. Coupons are usually given every time you see Coach Lior Doron through various services that he offers. You can also receive coupons for doing your homework and your referral. 1 for most times you say a positive sports psychology word (maximum one per class or workshop or practice). Please do not blurt out these words while he is speaking to get a coupon. Does not apply immediately prior, during or after "game time". 2 for liking Flow in Sports and/or 2 for liking ATPS / TSPA on Facebook. Let us know that's done (once it done). Please provide the coupons to Coach Doron for the gift certificate. 1 $1 off Boutique 40/30, up to 20 percent on almost all products. More info. Gold $500 includes $100 of the TSPA summer camp, $100 worth of coupons that you can share with up to five friends so that they can enjoy $100 off of a tennis camp, a left-side banner ad on the Flow in Sports website, a clinic, and up to three private tennis lessons. Flow in Sports is not responsible for services rendered between companies and clients. Court fee not included at the Caldwell Tennis Courts nor the non-member fee at the Woodland Tennis Club. Laval Liberty Students, click here for other prizes! Lake of Two Mountains Students, click here for other prizes! Lake of Two Mountains Hockey Students, click here for other prizes! TSPA and Flow in Sports staff, click here.